2. Answer any Five part questions. (i) Climate influence is more marked on agriculture than industry. Comment. ANSWER: Climate largely influence on agriculture. Agriculture requires proper climatic conditions for the growth on verities of crops. Rainfall and temperature must be moderate and suitable for the cultivation of particular crops. Industrial development is less affected by climate. (ii) The best Fishing grounds are developed at the meeting places of warm and cold ocean currents. Comment. ANSWER: Cold and warm climates are best fishing grounds in the world. Mixed sea water enriches in fish species and plankton that are the basic food Of fishes. Warm Gulf stream and cold Labrador current meet near gaud Bank which is one of the best fishing grounds in the world. (iii) Write the types of Forests. In Pakistan the forests are spread over 3.7 percent of the total area. 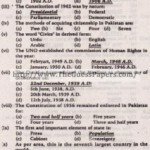 There are four kinds of forests in Pakistan. (i) Alpine Forests: There are three kinds. These are at the height of above 4000 meters and occur in the mountain slopes of Chartial, Dir, Swat and Kohistan, Alpine forests occur over a small area. The trees include silver, fir, Juniper and birch. They are found at the height 1000 m to 4000 m. They remain green throughout the year and have cone shape and the leaves are pointed. Swat, Dir, Malakand, Kohistan, Mansehra, Abbotabad and Murree hills are the main areas covered with these forests. The famous species of deodar, Keil, Chir poplar, Mapple, Willow and birch are found in these forests. They provide timber for making furniture and boxes Wood is also used as fuel. The valleys of Gilgit, Hunza, and Swat are rich in these forests. Mulberries, Apricots, Apples and Pomegranates and Walnuts are fruits of these trees. The hilly tracts, platean of Potwar and Baluchistanupto a height of 1000 meters are covered with these dry evergreen forests with some dry deciduous patches. Chilgoza and pencil pine are important trees in Baluchistan area Phulahi, Kahu an jund occur in the plateau pine. These forests are in the plain areas of all provinces. They have hardwood trees and can grow in adverse conditions also. They provide timber, firewood and fodder. Trees of Acacia-and babool are common here. They are located in the flood plains of Sindh and Punjab. They are a .good source of fuel, wood for Jurniture, & charcoal. The trees of Babool (Kekar) grow in small rainfall areas. (iv) Write about Truck farming. ANSWER: Truck farming, horticultural practice of growing one or more vegetable crops on a large scale for shipment to distant markets. It .ls usually less intensive and diversified than market gardening At first this type of farming depended entirely on local or regional markets. As the use of railroads and large-capacity trucks expanded and refrigerated carriers were introduced, truck farms spread to the cheaper lands of the West and South, shipping seasonal crops to relatively distant markets where their cultivation is limited by climate. The major truck-farming areas are in California, Texas, Florida, along the Atlantic Coastal Plain, and in the Great Lakes area. Centers for specific crops vary with the season. Among the most important truck crops are tomatoes, lettuce, melons, beets, broccoli; celery, radishes, onions, cabbage, and strawberries. (v) Write note on Textile industry development in China OR India. The art of cloth making from cotton originated from India. This industry has been flourished in various countries of the world. China is the largest producer of cotton textile. China has a better marketing facilities” and self sufficient in requirements. Shanghai is the chief center of the texitile industry. Other include Tunstin, Tsingtao, Hankow and comtion. The art of cloth making from cotton originated from India. All the process involved in the formation cloth from cotton were done by hands. Now textile industry has been flourished in India. Bombay is the most ideal place for textile industry. The first mill was established in Bombay. Calcutta is the second largest centre. Other important centers include Ahmedabad, Poona, Kanpur, Oehli and Madras not only self sufficient in their requirements and have to import large quantity annually. (vi) Write about the Natural gas producing countries of the world. ANSWER: Natural gas has remained in human use since prehistoric times. It is an important need of today. It is used for industrial as well as domestic use. RUSSIA: The largest producer of natural gas is central Asia is Kazakhstan and Uzbekistan. U.S.A.: U.S.A. produces about 80% of world’s natural gas. The use of natural gas in U.S.A. began in 1820. Today 3000,000 miles of pipe lines distributed gas to 27 states. CANADA: The third largest gas producing country of North America. Gas found in Quebec and Ontario. MEXICO: The gas producing areas lies in tar Pico Oil region. INDONESIA: Indonesia rank, top as gas producing countries in the Asia. Gas found in Smarta and Borreo. PAKISTAN: Pakistan also produced some amount of gas. (vii) Why are Prairies grasslands called the bread basket of the world? ANSWER: Wheat is the most important of all grains of temperate climate. Canada is the major producer of wheat. It is grown in almost every state. It is mostly grown in the cool temperature region. The Canadian wheat growing region is also known as the Bread Basket of the world. It export large amount of wheat. The activities which are related to the consumption and exchanged of things are called economic activities. Economic activities can be classified into production, exchange and consumption. (i) PRODUCTION: Hunting of animals, harvesting commodities from nature, subsistence agriculture, forestry, fishing, mining. (ii) EXCHANGE: Increasing the value of commodities by changing their location. (iii) CONSUMPTION: Use of commodities and services by human beings to satisfy their needs and wants. 3. Answer any four part questions. (i) Describe the means of Irrigation in Pak. ANSWER: Over the years, the canal irrigation system of Pakistan has witnessed many paradigm shifts in the context of advancement and effectiveness. From the olden practices of the conventional well system to the modern approaches of perennial canals and tube wells, the canal irrigation system of Pakistan has beheld some very significant changes. In the initial years of the adoption oj the canal irrigation system, there were various ways to irrigate the fields such as shaduf, charsa, Persian wheel and karez. In Shaduf, it is a balancing act where a bucket is attached to one side while on the other side the weight of the bucket is balanced by a tantamount weight. Shaduf is used to irrigate a small piece of land. Coming to Charsa, it is characterized by animal power, which is incorporated to draw the water from the well. Then comes the Persian wheel which is used to irrigate vast expanses of land and is a system of perpetual water supply. Coming towards the next one, it’s the karez, which is a horizontal canal, which is built underground in the foothills. This approach is primarily used to prevent the evaporation rate as it is built underground. 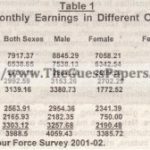 (ii) In which season does Pakistan receive most of its rairifall? Give reason. ANSWER: The average rainfall in Pakistan is less than 20 inches annually. Pakistan situated in the Monsoon region. The monsoon lauds receive most of their rainfall during the summer months ..Heaviest rainfall is on the coasts and stapes of mountains the annual rainfall is usually more than 80 inches in some places. Areas far from the sea receive about 40 inches of rain. (iii) Give reasons for the uneven distribution of Population in Pakistan. (i) The more densely populated centers of Pakistan are situated in the urban areas, which are the busiest centers of trade and commerce. Besides, so many industries have also deyeloped around these areas. The surrounding areas, around Lahore, Faisalabad and Gujranwala, are very fertile. The irrigation facilities are available, so the necessities of life can be had easily. The employment facilities in different industrial and commercial units are also available. That is why the population of rural area is migrating towards these urban centers and their population is increasing very rapidly. (ii) The areas situated in the plains are more densely populated than the mountain, regions, because the mountains having pugged topography are not suitable for agricultural activities. Besides, in winter, due to intense cold, snowfall is common and the mean of transportation become ineffective the establishment of industries not possible in these areas due to scarcity of resources. That these areas are thinly populated. (iii) In the plains, the density if population also differs in various regions. The areas of Punjab and Sindh there irrigation facilities and other resources are available; density of population is more than the dry Barani areas. Lahore, Faisalabad, Gujranwala, Multan districts are more dense than Attock, Jhelum and Dera Ghazi Khan Districts. Similarly in Sindh, Hyderabad, Larkana, Nawabshah districts are more densely populated than Tharparkar, Thatta, Dadu and Sanghar Districts. (iv) Why is rice not grown in Baluchistan on a large scale? ANSWER: Rice Is a’ crop of tropical and sub tropical areas. It requires an average temperature of about 90%. In areas with less than 40°F are not favorable for cultivation of Rice. Rice is a water plant and it requires a large amount of moisture. Most of the land of Balochistan is rocky and mountainous insufficient rainfall and dry weather is the measure cause. Rice is not grown on large scale in Balochistan because extreme condition of temperature and scanty rainfall it seems impossible. (v) Karachi is the main trade centre of Pakistan. Comment. international Airport, has gained the reputation of an international Airport. It has became a stop over for many flights coming from the West. PIA is providing the facilities of sift transportation of perishable goods to other countries which has increased the volume of exports and export receipts. The coastal area of Balochistan is about 850 miles lOng the people living around Pasni, Gwader, Ormara are engaged fishing. The chief verities of fish caught here. About 80% of the fish caught in this area is dried, canned, salted and exported to various Middle East and South Asian Countries. Three fishing harbors have been developed. Ice factories and refrigeration plants have been set up by the Government. South of Mithankot, the Indus and its tributaries join to make a greater river. In the lower Indus plain three barrages have been built across the Indus to divert its waters in to canals for irrigation. They have brought prosperity to central Sindh. (vii) Differentiate Barrage and Dam. ANSWER: Both the .dam and barrage are barriers constructed across a rivet or natural water course for diverting water into’ a canal mainly for purposes of irrigation, water supply etc. or into a channel or a tunnel for generation of power. In case of a barrage, its entire length across the river i.e. between the banks is provided with gates having their bottom sill near the river bed level. Thus, the storage behind the . barrage is solely created by the height of the gates. The dam on the other hand has spillway gates almost near its top level and the storage behind the-darn is mainly due to the height of concrete structure and partially due to the gate height. In both the cases, however, the number and size of gates is adequate to pass ·the design flood during monsoons. 4. Answer any Two part questions. (i) Highlight the distribution of Iron and Steel industry in Asia. ANSWER: The iron and steel industry and ferrous foundries produced goods in 2005 valued at about $126 billion. The industry consisted of about 79 companies that produced raw steel at about 122 plants, with combined production capability of about 106 million tons. Indiana accounted for about 22% of total raw steel production, followed by Ohio, 16%, Michigan, 6%, and Pennsylvania, 6%. Pig iron was produced by 9 companies operating integrated steel mills with about 31 blast furnaces in continuous operation. The distribution of steel shipments was estimated as follows: warehouses and steel service centers, 23%; construction, 15%; transportation (predominantly for automotive production), 13%; cans and containers, 3%; and other, 46%. About 1,100 ferrous foundries continued to be importers of pig iron into the United States, mainly from Brazil, Russia, and Ukraine. 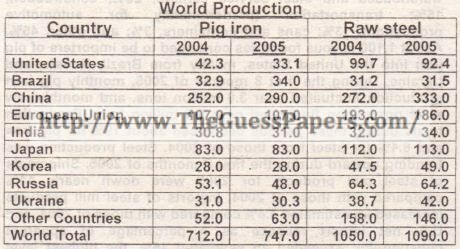 During the first 8 months of 2005, monthly pig iron production fluctuated near 3.0 million tons, and monthly raw steel production fluctuated near 8.5 million tons. 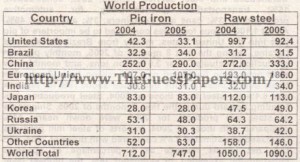 Production totals during these periods decreased about 19% for pig iron and 6.1% for steel from those of 2004. Steel production was trending upward during the first 8 months of 2005. Shipments of steel mill products for 2005 were down nearly 11% compared with those of 2004. Imports of steel mill products increased an estimated 3.4% compared with those of 2004,and U.S. net import reliance as a percentage of apparent consumption exceeded ) estimated 15%, the highest level since 2002.The recovery of the global economy that began in late 2003 has been steady and gradual. The International Iron and Steel Institute (IISI) and the Organization for Economic Cooperation and Development (OECD) estimated a world gross domestic product increase of 3.7% in 2005 compared with that of 2004. The U.S. Congressional Budget Office estimated the economic growth rate in the United States to be 3.7% in 2005 and 3.4% in 2006, with a steady decline to 2.5% through 2015. World consumption of finished steel products was estimated to increase by 3.9%to 5.0% by IISI. The OECD expected world steel demand to increase by about 5%, driven by the continuing strong growth in demand in China, where steel consumption was expected to increase by nearly 11%. However, increasing energy costs, including those of oil, during late 2005 may negatively affect the global steel industry, as happened in 1973 and 1979 when oil prices rose dramatically. Global steel consumption fell by 7.2% in 1975 and 11.6% in 1982, compared with that of the previous year, followed by a 6-year recession. Declining demand during 2006 while capacity expands may result in a capacity surplus. China continued in 2005 to be the fasted growing economy in the world and the world’s leading steel producer and consumer. China’s 2005 steel production was an estimated 333 million metric tons, 22% more than that in 2004, but growth was expected to slow in 2006. The China Iron and Steel Association stated that the country’s new steel policy will result in significant consolidations of a fragmented steel sector, which should reduce the threat of oversupply from China. Chjna’s top 10 steelmakers were expected to control more than 50% of that nation’s total steel output by 2010 and more than 70% by 2020. (ii) Why is Gold called precious metal? Describe the world distribution of gold. ANSWER: Gold an important position among all the precious minerals. The use of gold is common in the world from older days. Today it is used for making coins and ornament. Gold reserves are the common measure of a country’s economy. (1) UNION OF SOUTH AFRICA: It is the leading producer of gold about 50% of world’s output of gold is mined. (2) U.S.A.: Large deposits of gold and brass are present in the mountains.’ South Dekota, Deadwood, Alaska, Alabama and California are the major gold producing states. (3) RUSSIA: Russia is the second in gold production. She produces about 1/4th of the world’s gold. Most of the gold comes from the places Aldan and Kolyma, river in the northern Siberia. (5) JAPAN: Hokkaido and Honslu island produce some amount of gold. (6) PHILIPPINES: Philippines is another gold producing country. Gold is obtained in Philippines from Luzon Island and Mindanao. (7) INDIA: The famous mine of gold is located at the place Kolar in Maysore. These mines are known as Kolar mines. Hutti, Nandid roog, Raichur, Chittot and Warangal districts are other regions for the production of gold. (iii) Write the Physical and Economic factors necessary for the cultivation of cotton in world. ANSWER: Cotton is a soft, fluffy staple fiber that grows in a boll, or protective capsule, around the seeds of cotton plants of the genus Gossvpium. The fiber is almost pure cellulose. The botanical purpose of cotton fiber is to aid in seed dispersal. The fiber is most often spun into yarn or thread and used to make a soft, breathable textile. The use of cotton for fabric is known to date to prehistoric times; fragments of cotton fabric dated from 5000 BC have been excavated in Mexico and Pakistan. Although cultivated since antiquity, it was the invention of the cotton gin that so lowered the cost of production that led to its widespread use, and it is the most widely used natural fiber cloth in clothing today. Current estimates for world production are about 25 million tones annually, accounting for 2.5% of the world’s arable Iand. China is the world’s largest producer of cotton, but most of this is used domestically. The United States has been the largest exporter for many years. reliance on irrigation water drawn from the Ogallata Aquifer. Since cotton is somewhat salt and drought tolerant, this makes it an attractive crop for arid and semiarid regions. As water resources get tighter around the world, economies that rely on it face difficulties and conflict, as we” as potential environmental problems. For example, improper cropping and irrigation practices have led to desertification in areas of Uzbekistan, where cotton is a major export. In the days of the Soviet Union, the Aral Sea was tapped for agricultural irrigation, largely of cotton, and now salination is widespread. Cotton can also be cultivated to have colors other than the yellowish off-white typical of modern commercial cotton fibers. Natura”y colored cotton can come in red, green, and several shades of brown. (iv) Give an account of three rice-producing countries in Monsoon Asia. CHINA: China is the-largest rice producing country in the world. It accounts for about 35%of the total produce. INDIA: It is the second largest rice producing country in the world. River delta regions in south of India and Coastal plains are the centers of rice production. In Northern regions rice is cultivated in the fields of river Ganges and Jummna. Western Bengal has also prominent status in the production of rice. He has to import large quantity of rice and India is not self sufficient in her requirement. PAKISTAN: Pakistan produces a large amount of rice. Rice is mostly grown in canal irrigated areas of Punjab and Sindh. Different types of rice are cultivated in Pakistan and Pakistan has prominent status among rice exporting countries of world. (i) What arte the main sources of Electricity generation in Pak.? Give an account of Thermal power production in Pakistan. Mineral oil, Natural gas, Hydal power, Coal, Biogas and Nuclear energy have been used as a source of electricity generation. The progress of a country depends up on the power resources. The power resources not only fulfill the electricity .requirements but also plays an important role in the industrial development. Electricity generates through thermal power. Near Lahore at Shadara a thermal power ctation has been set up generated by natural gas. It produces about 85 M.W. thermal electricity. Three thermal units are being generated by coal in Sindh in Lakrra district and 150 M.W. thermal electricity is being produced. In the province of Balochistan near Makran coast at Pasni two thermal units are generated by diesel and 17 M.W. thermal electricity is being produced. This corporation has been constituted for the supply transmission and distribution of electricity to the district of Karachi and Lasbella. This corporation has set up thermal power station generated by gas oil in different areas of Karachi and now this corporation is producing 1756 MW as on June 30, 2006. Electricity from their power .station has become functional generated by atomic fuels in Karachi and 100 M.W. electricity is supplied by this project to the areas of Karachi. A thermal power station has been built by WAPDA at pairan Ghaib near Multan in 1960. Here steam is being used. Its production capacity was increased in 1963 and now its producing 265 M.W. of electricity. There are three thermal power station are working at Faisalabad. One station with the help of steam producing 132 Mega Watts of electricity and other two are gas turbine. One is producing 200 Mega Watts and Abdullah pur Gas turbine is producing 15 M.W. of electricity. To fulfill the requirement of electricity in upper Sindh a thermal power station has been built at Guddu , it is producinq 430 Mega Watts of thermal power projects in private sector. To meet the demand or electricity the government has made many contracts with the companies in private sectors to produce electricity and to sell it to WAPDA. (ii) Write about the main Sugarcane cultivation areas in Pak. Sugar is obtained from the sugar cane plant. It is usually a tropical plant requires high temperature, abundance of water and fertile soil. Sugar cane is an important crop of our country. It is used for making sugar. It is a Kharif crop. AREA: Accordinq to the economic survey of Pakistan in the year 2005 – 06 about 907 thousand Hecaters of land near under sugar cane. It is mostly grown in the canal irrigated areas of Punjab, N.W.F.P.and Sindh provinces. PUNJAB: The main suqar cane producing areas are Sargodha, Faisalabad,. Multan, Bahawal pur, Lahore, Gunjranwala and Rawalpindi. SINDH: Hyderabad, Badin, Khairpur, Nawabshah, Sukkar and Thar Parker are important cotton growing areas of this province. KHYBER PAKHTOON KHWA: Sugar cane is mostly cultivated in the areas of Mardan and Peshawar. However amount of sugar cane is also cultivated in Bannu and Daira Ismail Khan.